Intelsat now has five of our new high-throughput Intelsat EpicNG satellites in orbit, with four in service and IS-37e, launched last month, slated to complete testing and enter service in early 2018. Two of the Intelsat EpicNG design features we often talk about are the enhanced ability to mitigate both intentional and accidental interference, and the ease with which a user on the move, whether land, sea, or air, can switch from one spot beam to another as it crosses through the satellite’s footprint. We recently completed a round of testing that validated both of these attributes. Attended by DoD observers, the first showcased the capability of the Intelsat EpicNG platform’s advanced digital payload to work around efforts to interfere or jam the signals on the first Intelsat EpicNG satellite, IS-29e. 3) It connected the new video uplink channel to the original, now clear, downlink channel. A fourth thing might have been done, but was not part of the test. We could have delivered the isolated interfering signal to a location of the customer’s choosing, which would allow them to characterize the signal to better understand the nature of the adversary. This interference mitigation capability provides a level of reliability and security that is of vital importance to our customers. And it is part of our overall systematic defense-in-depth approach that detects, prevents and mitigates attacks so that mission assurance is greatly enhanced. In the second test, we used IS-29e to validate the beam-switching capabilities with General Atomics Aeronautical Systems and its Block 5 Predator B/MQ-9 platform. Beam switching is crucial for UAS to be able to fly over wide areas and maintain a connection with the satellite both for flight operations and transmission of sensor data. The tests were performed at the General Atomics flight test facility adjacent to the Grand Forks Air Force Base in North Dakota. During the tests, the UAS flew 1,075 nautical miles round trip while switching between spot beams on Intelsat IS-29e. We verified command-and-control as well as sensor data transmissions from the aircraft multiple times in both beams. In the tests, closed loop control of the aircraft had less than 5 seconds of outage. This was validated over multiple beam switches. Video transmission from the UAS had less than 10 seconds of outage during those beam switchovers. The additional time for the video was due to re-synching of the decoder at the receive site. To conduct the testing, the FAA granted General Atomics a waiver that authorized the Block 5 MQ-9 to fly in airspace managed by air traffic controllers without the requirement of following it with a manned airplane, which was a first for both the FAA and General Atomics. The company has been developing UAS technologies for nearly 25 years and recently established a center in North Dakota to train UAS pilots and payload operators. HTS platforms like Intelsat EpicNG are larger and more powerful than any previous satellites, delivering new capabilities to our defense and other government customers. We had already done earlier tests to establish that the Intelsat EpicNG spacecraft offer bandwidth efficiency improvements in the range of 165% on current networking hardware and up to 330% on next generation ground networking technologies for small mobility antennas. These latest tests demonstrate the ability to work around interference and smoothly move a signal from one beam to another on the satellite to maintain contact in flight providing further proof of the value of this constellation to our government and commercial customers. GMC: Which services and solutions are key to Intelsat General’s military and defence customers? Rory Welch: It’s all the voice, video, and data communications services that our government users need, although we do have commercial users too. Global end-to-end solutions are our bread and butter. Many organizations value the fact that we can connect their offices, terminals, vehicles, and aircraft and bring that information back to their headquarters or field offices, regardless of location. Intelligence, surveillance and reconnaissance (ISR) is another big area for us on the applications front. There are also simple bandwidth sales, which are supporting many different types of applications, from land-based vehicles to maritime vessels. We have a very broad offering. The new things that we’re getting into are what I’m focused on right now, namely the IntelsatOne Flex service, which is a managed network for airborne, maritime and ground systems. We already have Intelsat OneFile Maritime up and running, and Intelsat General is working on the government users’ segment. Within Intelsat General, we’ll be touching on the commercial side as well as the government sectors, because when you bring out an offering and you start working with channel partners, often those channel partners are already serving both government and commercial customers. The recent hurricanes that hit Florida, Texas and Puerto Rico once again spotlighted the frailty of terrestrial communications services. Hurricane-force winds in the Florida Keys and Houston brought trees down on utility lines carrying telephone and Internet service and knocked out cell phone towers, while Hurricane Maria completely destroyed the terrestrial communications infrastructure of Puerto Rico and the U.S. Virgin Islands. As experience over the past few years has shown, land-based communications services often are unavailable for days and even weeks following a natural disaster. Whether the event is a hurricane, earthquake, flood or fire, disaster victims and the first responders coming to their aid cannot depend on communicating over wires strung along utility poles or through electrically powered cell towers. Federal, state and local emergency workers have come to rely completely on satellite communications in the early stages of a response, as was illustrated by the recent experience of Network Innovations (NI), a leading satellite solutions integrator based out of Calgary, Canada. Founded in 1988, NI has a global team of professionals located across four continents providing end-to-end satellite communications services to government customers as well as companies in the maritime, oil-and-gas and media industries. NI works with a wide range of satellite providers, including Intelsat General, to ensure they have the on-demand capacity needed by first responders following a disaster. Chad Gatlin, VP of U.S. Government Sales, said the company assisted emergency workers following both Hurricane Harvey, which dropped over 40 inches of rain on the Houston area in late August, and Hurricane Irma, which roared through the Caribbean Islands a week later before making landfall in the Florida Keys on Sept. 10. NI has a fleet of customized sport-utility vehicles packed with communications gear that can provide instant networks for first-response teams. 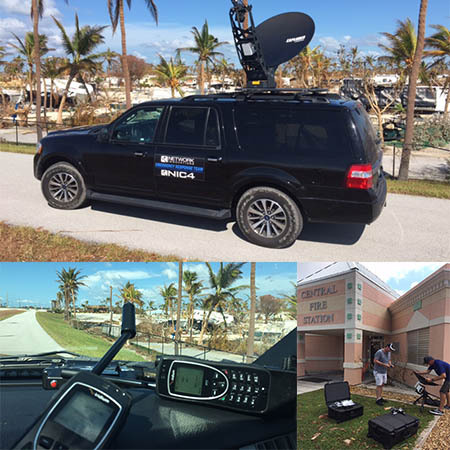 Immediately after Hurricane Irma passed through the Florida Keys, NI sent one of its vehicles equipped with a drive-away Cobham Explorer 8120 VSAT dish and five technical teams to assist both local agencies and public safety responders. Through the Intelsat Galaxy 28 satellite, NI used its proprietary MAVERICK software platform that integrates Newtec’s Dialogue Hub to provide communications to the response teams. Through the NI vehicle, responders were able to establish instant infrastructure to provide instant connectivity wherever it was needed. The teams delivered communications to Key West and Marathon police and fire units as well as established a communications station with the National Guard in Key West to allow people waiting in food lines to send emails or make calls to loved ones. As the U.S. Air Force forges ahead in crafting its next-generation wideband space architecture, and the Trump Administration seeks approval for a FY ’18 budget with strong increases in space defense spending, Via Satellite spoke with Air Force strategists, procurement decision makers and satellite industry government experts about how they see the DoD’s strategic communications priorities unfolding in a constantly evolving threat environment. LONDON — The trend in military communications: Huge data pipes and tiny terminals, all at affordable prices. And don’t forget cybersecurity. Satellite operators say they are bringing to market the products and services that fit these demands. One problem that typically gets in the way is that the industry’s business models and military requirements don’t necessarily align. Companies in the United States, particularly, have for years debated with the Pentagon a strategy for how to satisfy national security needs without having to design military-unique systems. The launch of the fifth in the Epic constellation of Boeing-made satellites, designed for maximum flexibility with the ability to interconnect between three different bands, will also be able to transmit full-motion video from small UAVs used by militaries, according to Intelsat General Corp. President Skot Butler. The launch of Intelsat’s Epic satellite 37e on an Ariane 5 rocket is scheduled for Sept. 29 in French Guiana on Flight VA239 along with Space System Loral’s BSAT-4a for a direct-to-home television service in Japan. It was rescheduled from Sept. 5 after an anomaly was detected in an Ariane 5 solid-booster electrical component that has since been replaced. According to Intelsat, 37e is the first satellite to interconnect between three bands: C, Ku and Ka. Tom Talovich joined Intelsat General in August 2017 as a Sales Director based in Southern California, where he works with a range of government customers and commercial firms doing business with the government. He brings nearly a decade of experience assisting government and commercial companies and agencies in determining their communications needs and then crafting a solution to fulfill those requirements as well as future demand. 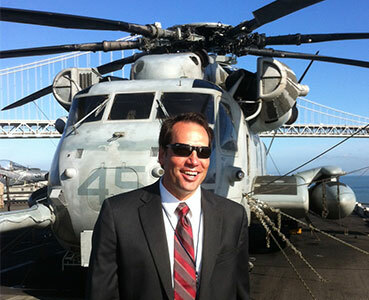 Talovich retired from the U.S. Marine Corps in 2008 after a career as a pilot and flight instructor. His final assignment was as deputy director of a systems test branch at Camp Pendleton involved in various ground and air command, control, and communication systems validation and verification tests. Following his retirement, he joined the San Diego office of Harris Corp. with responsibility for business development in areas that included wideband and tactical communications, space systems, avionics and electronics. Talovich left Harris for a year in 2014 to join the start-up Shield Aviation in San Diego that provided products and services in support of unmanned aircraft systems (UAS). He returned to Harris in 2015 as senior account manager for the company’s Naval Aviation and Afloat Programs. He was involved in the successful launch of line-of-sight and beyond-line-of-sight radio products for UAS being developed by the Navy for aircraft carriers. Before joining the Marine Corps in 1987, Talovich earned a bachelor’s degree in information systems at the University of Idaho. He later received his master’s in information technology management and systems engineering from the U.S. Naval Postgraduate School. His father was a U.S. Air Force bomber pilot, sparking a life-long love of aviation in Talovich and his two brothers. Together they have built and flown Vans RV-7 and RV-8 airplanes sold as ready-to-assemble kits by Vans Aircraft. DoD Satcom Users Workshop, December 12-14, 2017, Arlington, VA.